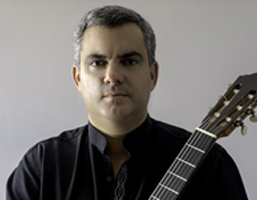 A Cuban native and United States resident, Edel is the first prize winner in more than 20 international guitar competitions including the Boston Guitar Fest, the Miguel Llobet International Competition in Barcelona, the Montreal International Guitar Competition and the Havana International guitar Competition. He was only 13 years old when Maestro Leo Brouwer described him as “perfect” and a “professional” in every sense of the word. As a concert artist, Edel has performed in major theaters and recital halls throughout the world including Palau de la Musica Catalana in Barcelona, Teatro Municipal de Viña del Mar in Chile, Sala Nezahualcóyotl in Mexico, Zitarrosa Theater Uruguay, Salle Gothique del Hotel de Ville de Bruxelles Belgium, IFT Theater Buenos Aires, Argentina, Teatro Nacional de Cuba among others, both as a solo recitalist and chamber musician with orchestras such as Barcelona Sinfonietta, Miami Symphony Orchestra and Cuba’ s National Symphony Orchestra. Muñoz’s recent tours have taken him to Europe and throughout North and South America, including his Carnegie Hall debut that brought the house down with a standing ovation. Edel has performed in more than 25 countries around the world. Edel Muñoz began his guitar studies at the “Vocational School of Art” in his native town of Matanzas and graduated from the “National School of Music” in Havana, Cuba in 1994. Edel has studied with Arsenio Diaz, Maria Victoria Oliver, Martha Cuervo, Victor Pellegrini, Jesús Cantero, Isaac Nicola and Leo Brouwer. After leaving Cuba, he continued his studies with Eduardo Isaac in Argentina, Luis Orlandini at the University of Santiago de Chile, and Alex Garrobe in Barcelona, Spain. He has performed in the Liege Guitar Festival in (Belgium), Guitars of the World Festival (Argentina), Arzamas Festival (Russia), August’s Festival (Venezuela), International Guitar Festival of Barcelona, Toronto Guitar Society – Symposium (Canada), Guild of American Luthiers Convention / Exhibition, Tacoma, (Washington) Portland Guitar Society, Austin Guitar Society, Madison Guitar Society, Knoxville Guitar Society (Tennessee), Salamanca Guitar Festival (Mexico), Virtuoso Showcase Classical Guitar (Nashville), Florida Guitar Foundation, Tulane University Guitar Series (New Orleans), Knoxville Guitar Society (Tennessee), Sauble Beach Guitar Festival (Canada), South Bay Guitar Society San Jose (California), Minnesota Guitar Society, Cleveland Guitar Society, Classical Minds (Houston), Paracho’s Guitar Festival (Mexico) and Havana’s International Guitar festival, among others. Edel has taught at the National School of Music in Havana, the Municipal School of Music, Asco; and the Municipal School of Music in L’Ametlla de Mar, Tarragona, Spain. He has also taught at various conservatories in Chile and the United States. Munoz’s students have won several top prizes in regional, nation and international competitions. He is constantly invited not only to perform at recitals but also to share his expertise by giving master classes at major music festivals, courses, seminars and workshops in prestigious universities around the world. Edel Muñoz is an outstanding performer with a commanding stage presence that has appeared as a revelation in the guitar scene of today.